Meanwhile, I had a little bit of time to do place people on my layout to give it a life. One month ago, one of our supermarkets offered kitchen-overhead-lights. I found out, that these were right for my layout. So I bought nine of them to give my model a "sun". Now, my layout makes a good view in the room too, when it is dark in the evening. Also there is enough light to do some jobs on the layout at night. Fantastic job! Your layout looks beautiful. Sie haben ein PN . Lovely depot. Please do put more pictures on the web? I likewise have a layout based on a depot scene. I am nearly finished with the major scenic work and will then post photos. Today I want to add some new pictures from my layout. As I have no space for a further section, I tried to make some further detailings. I tired to make some scenes with more little people to give the locomotie depot more life. A long time I wondered about a problem. I have some electric locomotives but how can I place them "realistic" in my world without building a complete catenary system. My solution became my "three 3-times-sections" in the depot. Section 1, the PAST, the area of the old steam-locomotives and their old coal-bunker. Section 2, the PRESENT, the diesel-locomotive-hall and its diesel equipment and section 3 - the FUTURE with the electric traction. The future-part need not be finished, and so I only planted 6 high carenary-steel-supports. The electric-locomotives are stored there for service in the electric-shop and mus be moved by diesels. That can be done with the digital consist-adresses. When the diesel is coupled with the electric-machine I call both locomotives by the consist-adress and both locomotives can be moved together while shunting. Also the coming electric traction was a good reason to give the cartenary-service car the right job at the catenary-supports. 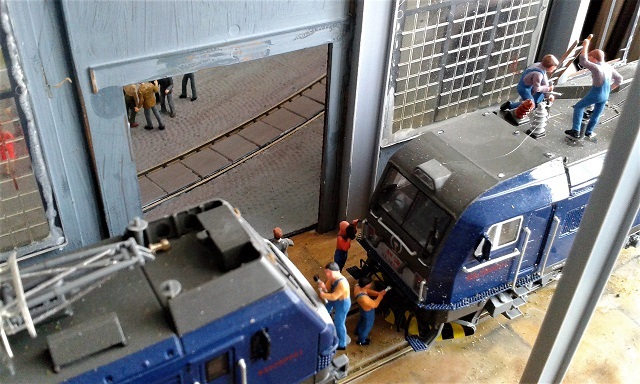 Track-workers, catenary-workers, as well as shop-workers give the layout its life. 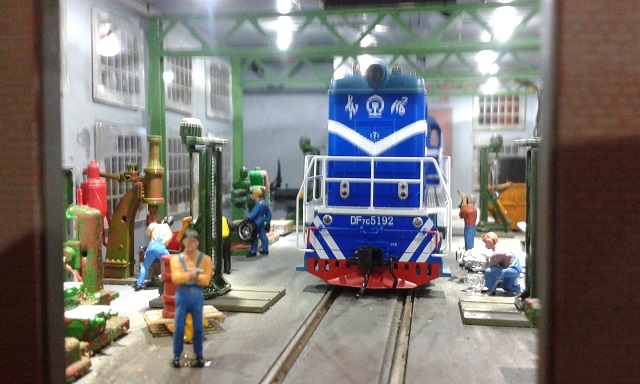 Also a TV-film-team is waiting for the roll-out of a new locomotive.